Please don’t think for a minute I am in any way, shape, or form ready to go back to work just because I’ve been a little tense on break. Leisure Stress be damned! 3. I listened to this song countless times growing up always trying to choreograph the next best dance routine. Early SYTYCD contestant or wannabe Solid Gold Dancer? I’ll let you decide. What crazy songs from your childhood have you been compelled to look up on YouTube? This entry was posted in Song of the Day! 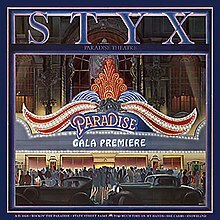 and tagged leisure stress, Paradise Theater, Styx, Too Much Time On My Hands by Teacher Goes Back to School. Bookmark the permalink.